Epic Cataract Canyon Rafting Trips: Guided White Water Adventures! 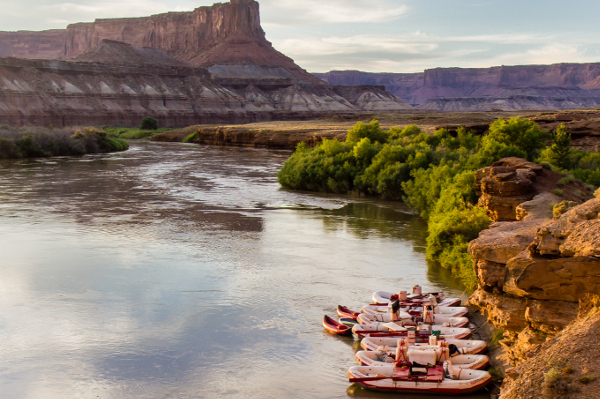 A Cataract Canyon rafting trip down the Colorado River has become synonymous with adventure. Buried in the heart of Utah’s Canyonlands National Park, the mighty Colorado River cuts through red rock and creates awesome 'cataract' rapids. Our rafts carry you to side canyon grotto’s, waterfalls and ancient Pueblo ruins that are otherwise inaccessible in the park. On this river rafting trip, we see the most vivid contrast between serene tranquility and all-out high adventure. 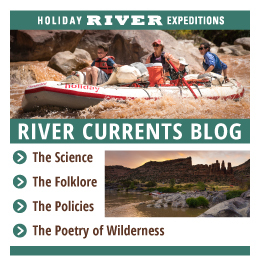 During the first segment of this Colorado River Rafting, the fast-moving current slides us quietly past brilliantly colored cliffs and towering table-top mesas. Here the river conditions both body and soul, giving you time to prepare yourself for the behemoth whitewater rapids awaiting below the confluence of the Green and Colorado rivers. Nowhere on its entire course does the Colorado River descend more precipitously than through Cataract Canyon. 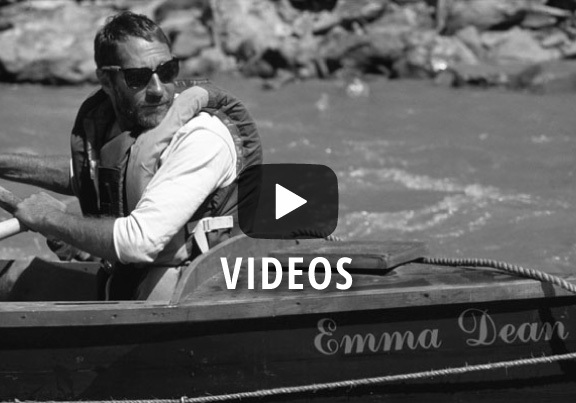 On night three of our river rafting adventure, the Colorado River will not rest. The roar of the cataracts will lull you to sleep, dance in your dreams, only to awaken you the next morning with a new song. 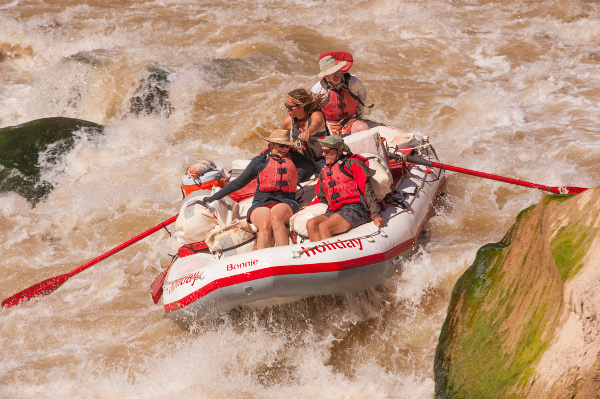 Time to batten down the hatches and hold on because this is Cataract Canyon whitewater rafting at its best. Twenty-three BIG ONES, among them Mile Long, Ben Hurt and the granddaddy of them all, The Big Drops, which is a succession of three heavy-hitters that will leave you laughing and cheering. We move 30 feet closer to sea level in less than a mile. 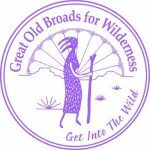 Join the Great Old Broads for Wilderness on the July 15-19, 2019 trip! The Colorado River through Cataract Canyon runs just downstream of Moab UT and into the heart of Canyonlands National Park. After all the rapids you can handle the river enters Glen Canyon National Rec. Area where we take out below the confluence of the Dirty Devil. One of the advantages of a river trip is the flexibility of the daily itinerary. It can vary widely from one trip to the next based on group desires, Mother Nature, and courtesy for other groups on the river. This typical itinerary illustrates a five-day trip rafting through Cataract Canyon. From August to September, we lengthen the Cataract trip by one day and follow this general itinerary. Day 1: Upon your arrival at our headquarters (8:00 a.m., Mountain Time), we will issue your waterproof bags. You can buy any last minute items from our accessories store at this time (see our packing checklist for a list of items you can find at our store). We will then take a 90-minute van ride to the embarkation point, where we will transfer to the boats. After pushing off we will float past a collection of tabletop mesas. Short hikes could reveal a variety of ancient artifacts or a petrified forest. Day 2: The River peacefully meanders into the heart of Canyonlands National Park. 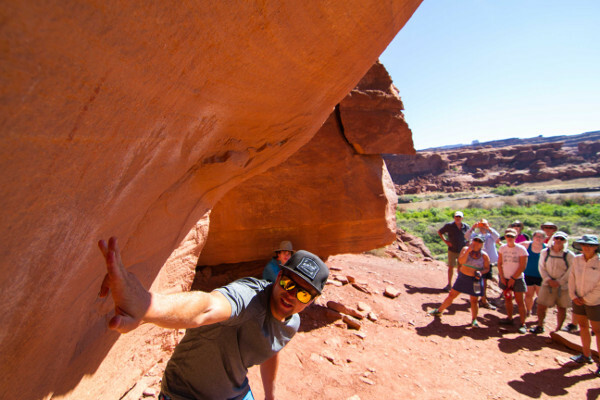 Quiet beaches, hidden canyons, and refreshing water fights are common throughout this section of the trip. Day 3: We reach the confluence of the Colorado and Green Rivers. The Ute Indians believe the Confluence to be the center of the universe. Just below the meeting of these two rivers enjoy a view of the Doll House, an appropriately named collection of freestanding, sandstone columns. Day 4: Possible early morning hike into Dollhouse. Ascend steeply to the canyon rim in the Maze District with red rock formations. After descending to the river, rafting the rapids of Cataract Canyon await. The climax: Big Drop Rapids with Little Niagara and Satan's Gut! Day 5: Begin the journey through majestic Glen Canyon and the former high-water mark for “Lake” Powell. Aided by motorboat “Hayduke” during higher lake levels, you’ll finish the trip at Hite Take-out. A two-hour drive brings you back to Green River. Our expected time of arrival back at our headquarters is from 5:00 to 6:00 p.m. 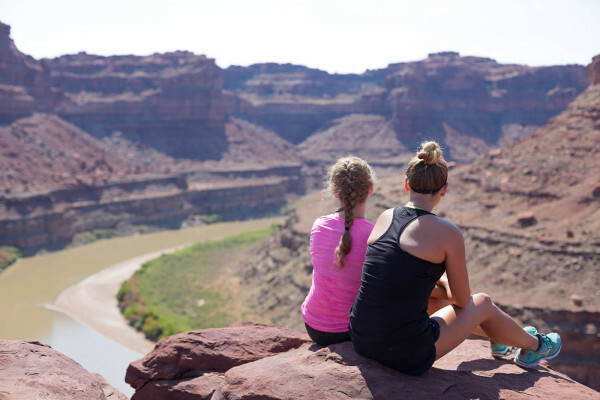 If you are on a 6-day Cataract Canyon trip, you can expect a similar itinerary to this 5-day. However, with lower late-season river flows and an extra day to play, you may take some extra time in the upper canyon exploring artifacts or side-canyons and reach the confluence sometime on the 4th day. You may dive into some whitewater rafting on day 4 but likely will spend the 4th night nestled between mighty rapids in the heart of Cataract Canyon. On Day 5 you would then run out the “Big Drops” and the rapids below Lake Powell’s historic high-water mark. This 6-day trip will finish much like its earlier season counterpart, exploring the upper reaches of Narrow Canyon and the boat-ramp back to the ‘real’ world. Karen was really helpful in getting the whole group together. She helped us with payments and was very accommodating for our special requests. The website is out-dated and doesn't really help trip planning. Even though the guides worked so hard, they also became part of the trip. They made sure that everybody in the group was having a good time, and they didn't exclude anybody. They helped everybody set up camps, get through the hikes, and kept us all safe. The food was great and camps were clean. They almost made me forget I was in true wild country. Our guides were exceptional! They were all so knowledgeable about geological formations, history of the Colorado River, and of course the rapids! The hikes were fun and a great diversion from the water. The food was fabulous! Many thanks to Ben, Rocky, Katie, Josh, and Nick for making the Cataract Canyon rafting trip the best yet! Everything was absolute perfection. Attention to detail was evident in every aspect of our five day adventure! Fantastic! We have done more than a few rafting trips with Holiday and are impressed with how consistently excellent our experiences have been. The guides are knowledgeable, helpful, and friendly! They go out of their way to make white water rafting a fun adventure!